Many of our guests comment on how cozy our home is, and we hope you will feel the same. Nestled within a few blocks of the Snow Summit, you’ll find our vacation home a great place to retreat to. 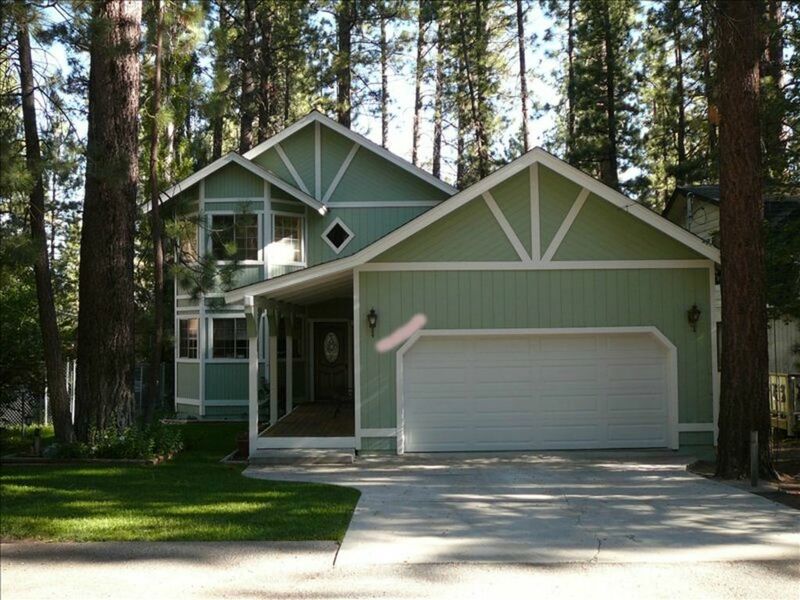 Whether you choose to come to Big Bear Lake for a Holiday family get together or for a few days of R&R you will find this home is well equipped. The floor plan of this large (2700 sq ft) home provides for 2 separate entertaining areas. Pull into the 2 car garage and enter on the ground floor you will notice the wide-open space of the great room with it’s high vaulted ceilings. Cuddle up in the living room and keep warm by the fire or watch TV (36”). The couch becomes a queen sofa bed, and the chair by the fireplace turns into a single sofa bed for a warm night's sleep. Dinner prep in the large well-equipped kitchen is a breeze. You will find all the comforts of home…maybe more like a sub zero, double oven, and dishwasher. Seating for mealtime at the table (96' long) features 6 chairs (large enough to put more chairs around it) and 4 bar-stools at the counter. Evening entertaining can extend out to the back yard with a large deck and a spa located under the gazebo. Also, the backyard is fenced in for the little ones. Bedrooms located on the 1st floor include the big master bedroom with King bed, and an attached full bathroom. The downstairs bedroom has a queen bed. This is a good sized room and hall guest bath easily accessible too. Upstairs is a 3rd bedroom, with adjoining full bathroom. This has 2 queen beds and a pretty tree-top view. Challenge each other to a game of Pool or just grab a good book and curl up on a couch looking out at the treetops in the 2nd entertainment room. There is another TV with VCR available for kids. Also, there is a double bed. Snow is NOT the only thing you will find in Big Bear Lake, warmer days offer a wide variety of activities. The lake is great for fishing, boating, canoeing, and kayaking. There are many opportunities to be adventurous too! How about para-sailing, ATV rides, horseback rides or take to the slopes with a mountain bike…majestic views included! For those of you who would rather take easy street, how about a trip to the spa, or a leisurely stroll on walk through the mountain meadows. Discover Big Bear Lake; it is worth exploring! *WE REQUEST**** NO SMOKING AND NO PETS, Please. Must be 25 yrs or older to rent. *********Thank You. Our kitchen is well equipped with everything that you can think of including a double oven, crock pot, Sub zero refrigerator, etc. Enjoy the hot tub located on the back deck with a covered Gazebo. Every detail for the house was perfect you don’t need nothing to enjoy this beautiful house. We have a very good experience with this reservation. We loved our stays. Everything was good. Only thing is that the grill was not in the house. So we could not do a barbecue. Otherwise it was ok. Overall, this was a good place to stay in Big Bear Lake. The home itself is very spacious, the back deck is large with plenty of seating, and the owners are incredibly friendly and accommodating. Unfortunately, during our stay the spa would not heat, and was unable to be repaired while we were there, but the owners did offer a concession on the amount paid as a measure of good faith, which we appreciated. The kitchen was large and fully stocked with appliances and cooking accessories, but some of the appliances are dated and the refrigerator, for example, froze a lot of the produce we stored. There were also ants in the kitchen and dining area which, as I understand it, is typical for this area, but it was a challenge to cook since whatever would be placed on the counters during the preparation would have to be guarded from the ants. The game room upstairs was fabulous! My children loved it! It was also nice to have the sitting area upstairs where older kids or even a separate family could retreat and "get away". The beds and pillows were comfortable and the bathrooms clean and large. Overall, this is a good home and we would likely choose to return. We were very happy to stay at Doreen's mountain house. It is well maintained and within walking distance of Snow Summit. We found it very easy to walk to Snow Summit in snow boots, but it might have been a little far in ski boots. The fixtures are a little dated, but who picks a cabin based on the dishwasher? Clean, comfortable, warm, and perfectly located on a quiet side-street very near to the ski hill. Thanks!!! My wife and our two young children stayed here for two nights. The house is on a quiet street close to the village and everything else. It was very clean, comfortable, and well-equipped. The owners reached out to me immediately after booking and were very pleasant to deal with. This property is large and can easily fit a large family. I would stay here again in an instant. All guests 25+ yrs or with guardian. Rates are subject to change until reservation is confirmed.